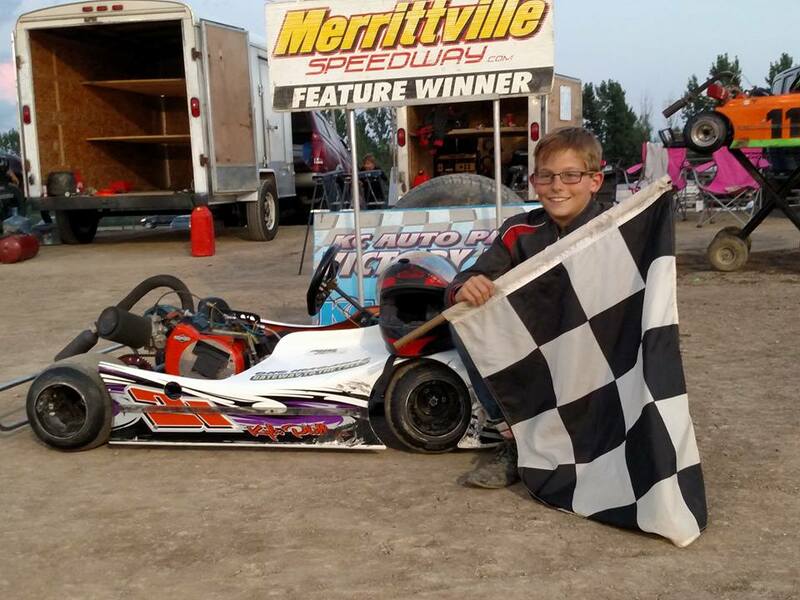 THOROLD, ONTARIO (August 12, 201) – Noah Kugler won his first kart feature of 2015 on August 11 at Merrittville Speedway in the Tim Phillips Garage KC Auto Parts Novice 2 Division, while Tucker Wood continues to set the pace amongst all Lucas Oil Weekly Karting Series race teams, taking home his tenth win in 11 starts in the RCM Racing Equipment Junior 1 Division. Close behind Wood in feature wins is Joshua Hansen, who made his ninth visit to Victory Lane in the Superior PetroFuels Junior Restricted Division. Performance Manufacturing Lucas Oil Weekly Karting Series action also had Logan Iliffe win his third feature of the season in the Vansickle Pet Valu Novice 1 Division, while Kyle Phillips won for the fourth time of 2015 in the Ed MacPherson Construction Junior 2 Class. Dylan Culp won for the sixth time of the season in the Wilder Racing Engines Senior Animal Class. Bob Ling rounded out the Feature Winners – besting a seven-kart field in the Cassell Manufacturing Senior Fun Division. Kart Racing continues Tuesday August 18th – Action starts at 7 PM and Grandstand Admission is FREE. Vansickle Pet Valu Performance Manufacturing Novice 1 Division – 6 laps – Heat 1 – Hayden Klager, Madelyn Goulding, Logan Iliffer, Sam Bolduc, Cohen Corbett, Hana Rothwell. Heat 2 – Logan Iliffe, Hana Rothwell, Sam Bolduc, Cohen Corbett, Madelyn Goulding, Hayden Klager. Tim Phillips Garage KC Auto Parts Performance Manufacturing Novice 2 Division – 6 laps – Heat 1 – Spencer Maytum, Noah Kugler, Owen Kaiser. Heat 2 – Spencer Maytum, Owen Kaiser, Noah Kugler. RCM Racing Equipment Performance Manufacturing Junior 1 Division – 8 laps – Heat 1 – Tyler Davidson, Tucker Wood, Tanner Bolduc, Joey Priestley, Zach Trotter, Ryden Lapcevich, Brittany Kelly, Jackson Maytum, Aiden Speck. Heat 2 – Tucker Wood, Joey Priestley, Ryden Lapcevich, Tyler Davidson, Zach Trotter, Zach Trotter, Tanner Bolduc, Brittany Kelly, Jackson Maytum, Aiden Speck..
Ed MacPherson Construction Performance Manufacturing Junior 2 Division – 8 laps – Heat 1 – Kyle Phillips, Dalton Slack, Davis Grocott, Donny Lampman, Chris Crawford. Heat 2 – Kyle Phillips, Jaedon Lawson, Dalton Slack, Davis Grocott, Donny Lampman, Chris Crawford. Superior PetroFuels Performance Manufacturing Junior Restricted Heavy Division – 8 laps – Heat 1 – Joshua Hansen, Randy Giroux, Trevor Wright, Jacob Wilson, Austyn Werstroh, Anthony Kelly, Ryleigh Sliter, Sophie Horton, Nathan Boisvert. Heat 2 Joshua Hansen, Randy Giroux, Trevor Wright, Jacob Wilson, Anthony Kelly, Sophie Horton, Austyn Werstroh. Wilder Racing Engines Performance Manufacturing Senior Animal Division – 10 laps – Heat 1 – Tyler Winger, Garry Overholt, John Matthews, Travis Majuery, Dylan Culp, Daniel McKay, Ashley Moore, Kathleen Lampman. Heat 2 – John Matthews, Travis Majuery, Tyler Winger, Garry Overholt, Ashley Moore, Daniel McKay, Kathleen Lampman, Dylan Culp. Vansickle Pet Valu Performance Manufacturing Novice 1 Division – 8 laps – Logan Illiffe, Madelyn Goulding, Hayden Klager, Sam Bolduc, Cohen Corbett, Hana Rothwell. Tim Phillips Garage KC Auto Parts Performance Manufacturing Novice 2 Division – 8 laps – Noah Kugler, Owen Kaiser, Spencer Maytum. RCM Racing Equipment Performance Manufacturing Junior 1 Division – 15 laps – Tucker Wood, Tyler Davidson, Joey Priestley, Tanner Bolduc, Zach Trotter, Ryden Lapcevich, Brittany Kelly, Jackson Maytum, Aiden Speck. Ed MacPherson Construction Performance Manufacturing Junior 2 Division – 15 laps – Kyle Phillips, Dalton Slack, Davis Grocott, Jaedon Lawson, Donny Lampman, Chris Crawford. Superior PetroFuels Performance Manufacturing Junior Restricted Division – 15 laps – Joshua Hansen, Trevor Wright, Anthony Kelly, Randy Giroux, Jacob Wilson, Sophie Horton, Austyn Werstroh, Ryleigh Sliter. Cassell Manufacturing Performance Manufacturing Senior Fun Division – 15 laps – Bob Ling, John Farnam, Len Comeau, Mike Speck, Kyle Rothwell, Rob Goulding, Seth Roy, John Lavallee. Wilder Racing Engines Performance Manufacturing Senior Animal Division – 20 laps – John Matthews, Travis Majuery, Ashley Moore, Dylan Culp, Tyler Winger, Daniel McKay, Kathleen Lampman, Garry Overholt.. The 2015 Lucas Oil Kart Weekly Racing Series for Merrittville Speedway’s 7 Divisions is brought to racers by partners including Performance Manufacturing, Vansickle Pet-Valu, Tim Phillips Garage, Ed MacPherson Construction, RCM Racing Equipment, Cassell Manufacturing, Superior PetroFuels, Briggs & Stratton, KC Auto Parts, Wilder Racing Engines and Burris Tire. Lucas Oil Products is one of the fastest growing additive lines in the consumer automotive industry featuring a premium line of oils, greases and problem-solving additives. Through innovative product research and development, along with aggressive marketing programs, Lucas Oil Products has established itself as the top selling additive in the industry. Look for Lucas Oil Products at their favorite automotive retailer or repair centre including the KC Auto Parts, Tim Phillips Garage, Kala’s Hardware and through RCM Racing Equipment.